Interestingly, a message in the social media regading a press conference to be addressed by the BJP veterans also turned out to be fake. New Delhi: A day after a fake letter critical of the BJP leadership and Lok Sabha poll prospects circulated in his name on the social media, party veteran M.M. Joshi on Monday sought an inquiry by the Election Commission into the fake letter. The fake letter was addressed to another party veteran L K Advani. Both Mr Advani and Dr Joshi have been denied a ticket to contest the parliamentary polls due to the unoffocial age bar of 75 years. Interestingly, a message in the social media regading a press conference to be addressed by the BJP veterans also turned out to be fake. Demanding an investigation by the poll panel, Dr Joshi has written to Chief Election Commissioner Sunil Arora that he has not written any such letter. “My friends in media called me up and told me that since yesterday a letter addressed by me to L.K. Advani Ji has been circulated on social media. I have read the contents of it and I am attaching them with this letter. 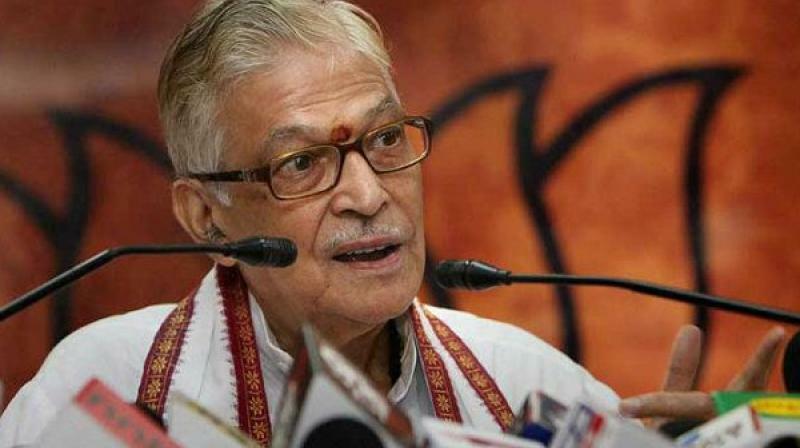 I have not sent any such letter to Advani Ji,” Dr Joshi wrote. “indly, immediately look into the matter and find the source of the letter, through which it came to social media,” Dr Joshi said. Both Dr Joshi and Mr Adavani, who are among the founders of the party, had won last Lok Sabha elections in 2014 from Kanpur and Gandhi-nagar, respectively, but they have not got the party tickets to fight polls this time.